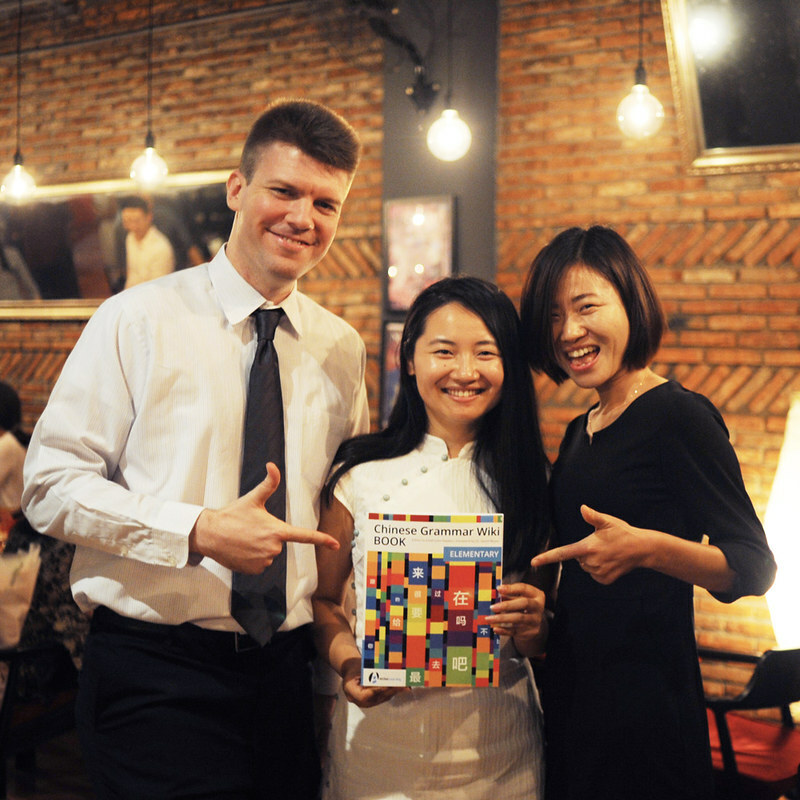 Chinese Grammar Wiki: it’s a print book now! 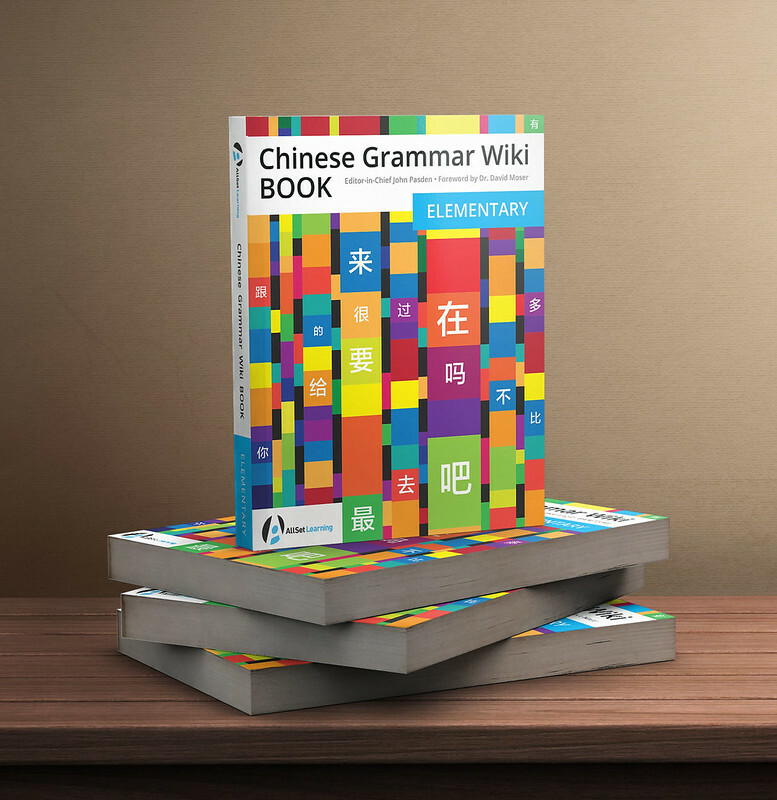 It’s hard to believe I’ve been working on converting the Chinese Grammar Wiki ebook into a print book for almost a year, but the work is finally done! You can buy the new print version on Amazon. It’s a hefty 2.2 pounds, and has 400 pages. And that’s just beginner and elementary (A1-A2)! My staff and I were so happy to finally launch the print book that we promptly threw a party over it. It was going to be a thick book no matter what, so I made sure we didn’t skimp on font size (the Chinese and pinyin fonts are a decent size), line height, or margins. The margins are quite generous. This is a book that you can take some serious notes in, if you are that type of learner. One of the greatest things about this book, for me, is that the Chinese Grammar Wiki is still there, online and free, continuously updated. Students love it. But for anyone who can afford to support this ongoing project of ours, having an offline version (ebook or print) can be seriously useful. Special thanks to the always inspiring Dr. David Moser for writing the Foreword, and my tireless content editor Chen Shishuang. All friends of the Chinese Grammar Wiki: please help spread the word! We’re already working hard on the next book (I’d say it’s 75% done), and we need the support. Have you considered recording the example sentences? It would be a great way to create an extensive “Graded Sentence Deck” that one could use to practice listening comprehension and vocalization while pursuing full coverage of the grammar structures. It is a resource I would value and purchase if made available. I know of a few resources out there that provide something “kind of sort of almost” along those lines. One is focussed on vocabulary coverage through the lense of HSK levels, I don’t know that grammar was given much thought and it isn’t explained. The other also lacks explicit grammar explanations has not been vetted by an instructor of chinese (to my knowledge). I consider both to be worthwhile despite the described limitations. That said, I believe the corpus of your work could be the foundation for an extremely useful bank of recorded audio. You’re not the first person to suggest this, and I agree that it’s a good idea. But until recently, all of those sample sentences were quite frequently getting edited, deleted, and added to. Now, A1-A2 are fairly stable, but B1’s are getting lots of edits. Will we see a C1 and C2 version in the foreseeable future? Even after ten years of study I’ve yet to master these irregular grammar patterns. I already purchased the elementary level eBook, I can’t wait until the intermediate level book comes out. It will definitely be worth the wait. Throughout my studies your website has always been a clear and concise resource that has helped both me and my mother, so I look forward to helping support the project again. Can’t wait for the new book! Let us have a deal when it first comes out!